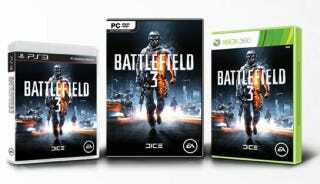 Yesterday afternoon, Kotaku reported that Battlefield creators DICE would be releasing the game's first trailer. That trailer, apparently, is already online, supposedly leaking tonight. Images of the multi-player military shooter were revealed in the latest Game Informer. The game has the same visual vibe of Battlefield: Bad Company 2, but with decimated environments. As mentioned previously, GI mentions a few new technical features, including animation techniques borrowed from the EA Sports guys and an "exponential leap in destructibility." The trailer shows low-qualify video footage of game combat, with radio chatter. The screen goes black after a helicopter is blown to bits by a jet, and the game's title, Battlefield 3, flashes on screen. The release date given is Fall 2011. The game will include jets and the ability to go prone as well as 64-player multi-player (for PC). Kotaku is following up with EA to confirm whether this is in fact the new Battlefield 3 trailer and, you know, not another one of these. Update: The game's website is live. The trailer is real.